From Michael Reese: It’s that time of year again. 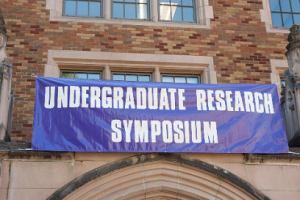 The University of Washington has once again invited BC students to present at the UW Undergraduate Research Symposium. This symposium is the single largest presentation of undergraduate research in the Western US. Participating is a great learning experience—and is a very impressive item on a student’s resume or CV. The deadline for submitting an abstract and applying to present at the Symposium is Monday, February 13. Students may present individually or in teams; they also have a choice of presenting a poster or giving a talk. A full timeline of the process appears here, and additional resources for students and their faculty mentors may be found here. Students and faculty interested in participating in the symposium should contact me, Michael Reese. I have the codes that allow BC students and faculty mentors to access the UW’s EXPO system, which is used to submit abstracts. Bellevue College may have as many as ten teams of BC students present; codes will be awarded on a first-come, first-served basis. Thank you so much for helping to spread the word about this great opportunity to showcase some of the impressive work being done here at BC.